Jóna has been travelling there since she was 6 years old, and therefore knows the country extremely well, also speaking fluent Icelandic. For first time visitors Jóna organises a special exciting and comprehensive tour brimming over with visits to the North, East and Southern areas of Iceland where many of the most spectacular sites are found. Visitors return again many times with her to this unique land of contrasts, to other areas such as the North Western Wilderness part of Iceland. The island has a magnetic and magical effect on many. Jóna Tours is a small travel company which has a unique place in the tourist industry. Based on personal organisation with emphasis on attention to detail in all aspects of the holiday. Special attention is given to single ladies, either travelling on their own, or for some who may wish to team up with another member. Dietary needs are arranged carefully. Jóna accompanies many of the tours she organises, having no more than 20 members in each group. 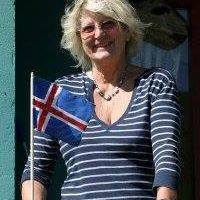 She is enthusiastic and is keen to show you as much of Iceland as is possible. Jóna attends two exhibitions a year. Members pour in from recommendations and from members returning again and again. This special tour, hunting the Northern Lights, during some of the most spectacular months of the year in Iceland. I strongly recommend this tour to all first time visitors to Iceland. Let yourself succumb to the fascination of the deep blue sea and its contrast with the emerald green of the forests and mountains.